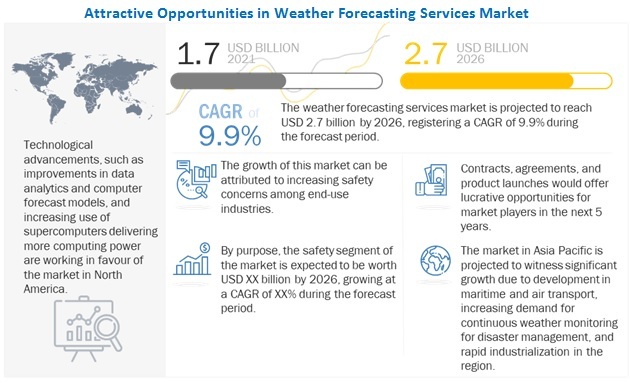 The weather forecasting services market is projected to grow from USD 1.10 Billion in 2016 to USD 1.56 Billion by 2021, at a CAGR of 7.15% during the forecast period. The base year considered for the report is 2015, and the forecast period is from 2016 to 2021. The report forecasts the weather forecasting services market over the next five years. It also identifies and analyzes evolving technologies, recent developments, and high potential geographic regions and countries. The market has been analyzed on the basis of industry, purpose, forecast type, and region. The report provides a competitive landscape for key players in the market with explicit focus on their product offerings, key financials, and growth strategies adopted by them to sustain their market position. Key players in the weather forecasting services market have been identified through secondary research and their market shares have been determined through both, primary and secondary researches. These include study of annual and financial reports of top players and extensive interviews of key industry experts. Some of the secondary sources include International Air Transport Association (IATA), Organization of Petroleum Exporting Countries (OPEC), and World Bank Database, among others. The ecosystem of the weather forecasting services market comprises weather forecasting service providers, such as The Weather Company (U.S.), Accuweather (U.S.), StormGeo (Norway), Meteo Group (U.K.); system manufacturers such as Vaisala OYJ (Netherlands), Sutron Corporation (U.S.), Campbell Scientific Inc. (U.S.); weather data monitoring companies/agencies such as The National Oceanic and Atmospheric Administration (U.S.), Environdata Weather Stations Pty Ltd (Australia), National Aeronautics and Space Administration (U.S.); and end users, such as media, airlines, ships, power generation facilities. In this report, the weather forecasting services market has been categorized into three key segments, namely, industry, purpose, and forecast type. The report offers revenue forecasts and analyzes industry trends that are predominant in this market. On the basis of industry, the market has been classified into renewable energy, shipping, aviation, oil & gas, media, agriculture, insurance, retail, utilities, and others. The renewable energy segment is expected to grow at a highest CAGR from 2016 to 2021. In 2016, the renewable energy segment is estimated to account for the largest share of the market, owing to importance of renewable energy segment in determining the demand and supply of energy commodities. Based on purpose, the weather forecasting services market has been divided into operational efficiency, safety, and others. The operational efficiency segment is estimated to lead the market during the forecast period. Wind energy firms need weather forecasting services for efficient output; solar energy plants need weather forecasting services for estimating power output; and the shipping industry needs weather forecasting services to determine economical and safe routes. Likewise, other industries also use weather forecasting service to optimize their operations and increase their economic viability. On the basis of forecast type, the weather forecasting services market has been classified into short range, medium range, and long range. The medium range segment of the market is projected to grow at a highest CAGR during the forecast period. Introduction of advanced data analytics and machine learning techniques for computers have increased accuracy and reliability of weather forecasts over medium range. These technological advancements have fueled the growth of the medium range segment of the market. 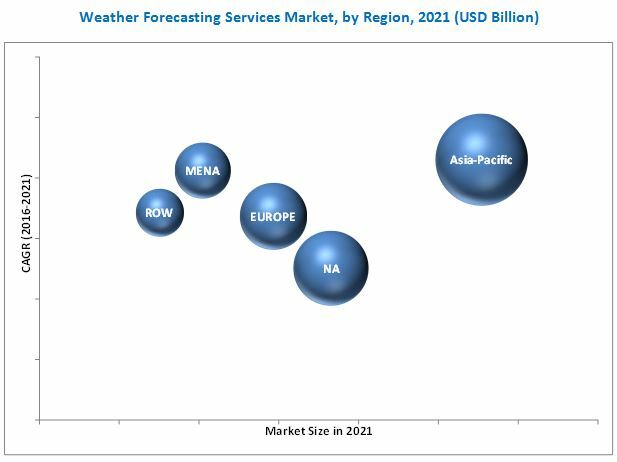 The weather forecasting services market has been studied in five major regions, namely, North America, Europe, Asia-Pacific, Middle East & North Africa (MENA), and the rest of the world. The Asia-Pacific region is estimated to account for the largest share in the market in 2016. This market in the Asia-Pacific region is anticipated to grow at the highest CAGR during the forecast period.